This ceiling hinge TV lift mechanism is surface mounted and be be retrofitted to any type of ceiling, its available in two models catering for screens up to a maximum of 46". The screen is concealed within the integrated housing which with a press of a button will hinge the TV downward through to 100 degrees for perfect viewing. 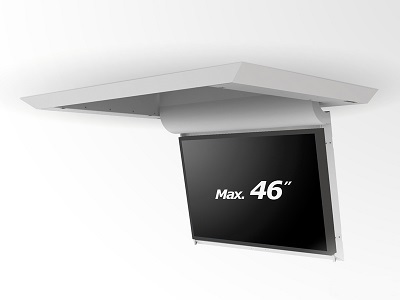 This series of ceiling tv lift allows flat screen televisions to be concealed easily without the need to cutout the ceiling and reinforce any joists, the unit fits neatly and easily to any ceiling. The unit is very shallow with a total height of only 100mm providing a unobtrusive solution that is sure to be very popular with DIY installations. The unit is particularly useful where floor space is a premium or there is no other place to locate a TV. The surface mounted ceiling TV lift mechanism can be controlled by RS232, contact closure and as standard. Other options include IR and RF remote control units. Range of sizes up to 46""
AV Installs Ltd also offers full installation services for this product call AV Installs today on 0800 669 66 00. Screen Size Up to 32" Up to 46"